PVC banners are also commonly known as outdoor or vinyl banners. Outside of board printing, PVC banners are the most popular and cost effective means of large displays. They are versatile, waterproof, accessible and offer a high quality print which makes them an ideal means of large format display, available as a solid PVC or Mesh. Banners are an effective means of advertising or showcasing an event, commonly used for building hoardings and even perfect for personal use. We print on a strong 450gsm banner 'stop tear' material, which is a reliable cross weaved material designed to help prevent rips, tears and any damage. All banners are hemmed and eyeletted as standard, allowing for easy fitting and a professional looking finish. Banners can also be produced with loops for fitting onto poles and other structures. What's the largest size banner I can print? The Banner Rolls we stock are 3.2m in width, which leaves us with around 3.1m of printable width. This means that one of the maximum out of the 2 dimensions would need to fit to 3.1m, however the over length can be as long as 50m without any issues. What is hemming and eyeletting? A hem on a PVC Banner is simply where the edges on the material are folded over itself and stitched together, leaving you with a smooth looking finish. Eyelets are small brass rings that are punched through the banner material, similar to a big hole punch. These help you put your banner up for display with cable ties or screws. 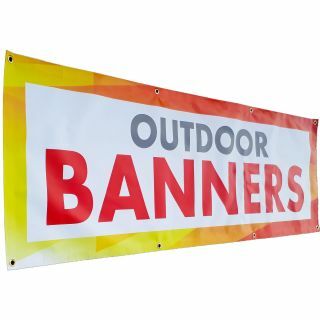 If you have any specific requirements in terms of the hem and eyeletting of your banner, just let us know. What is the difference between the normal PVC and the Mesh banners? Can Banners be stitched with loops? Yes, if your banners require loops for fitting we just need to know the size of the loop you require. In this case artwork would need to be supplied with extra bleed to accomodate for the loops. Our PVC and Mesh banner material is 450gsm, we use a special cross weaved material to help prevent the banner from tearing.